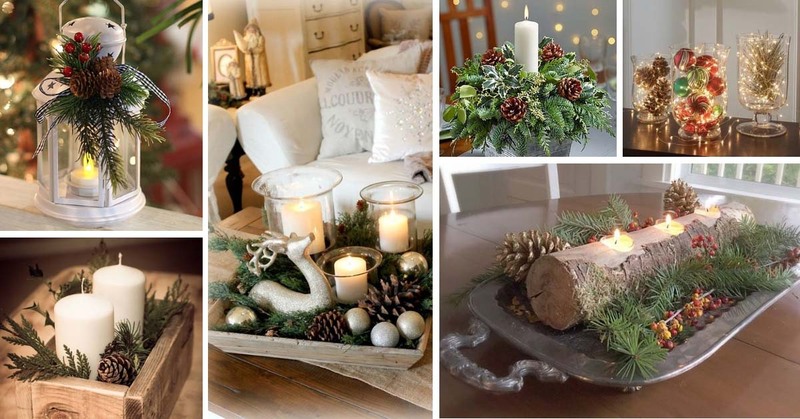 Simple, effective and clean – this Christmas décor represents the character of the home pretty well. It creates a dignified image with a simple touch of berry red and white elegance. You can draw the quote yourself or buy stickers from your local stores and simply place them on the door. Sometimes all you need is a couple of words to make a powerful statement. Keep in mind this isn’t valid just for Christmas or holiday seasons. It can be applied to your everyday living if you choose wisely. We are often bombarded with sayings nowadays, so make the message simple, concise, straightforward. Pillows and patterns make a happy bedroom. 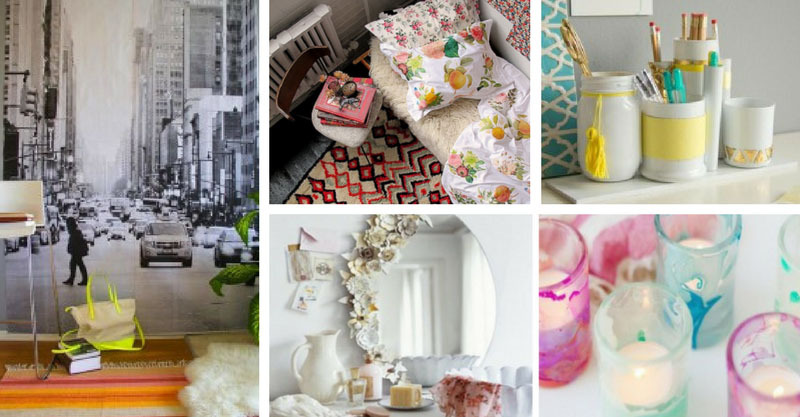 Why is décor so essential? Well, truth be told – it isn’t. Sometimes, we all like to dispose of clutter, decorations or gifts. We simply can’t stack everything in our lives if we want energy to move freely. 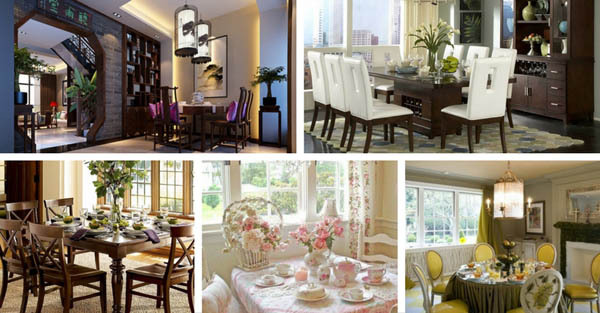 So décor becomes valuable only when you personalize it, otherwise, it’s simply “beautiful”. What’s your flair for decorations? Proper lighting, gray grounding colors and a tiny space. This room is a challenge for you if you are a fan of big windows where the light comes through and plays inside your room. 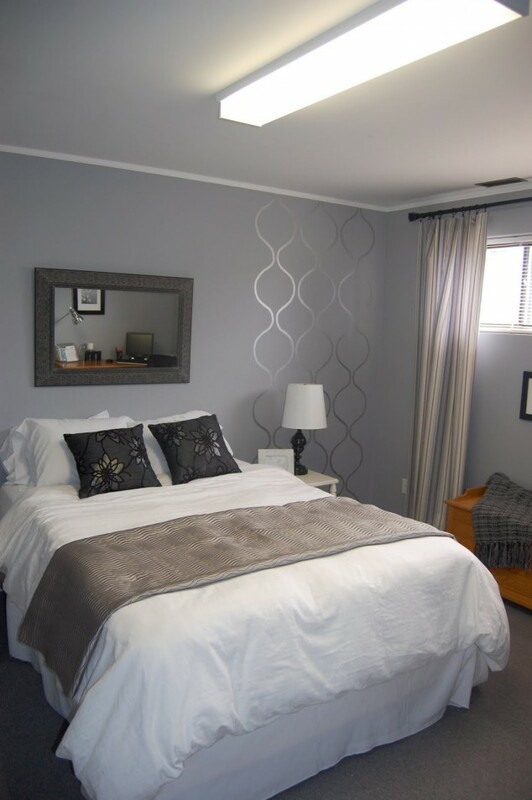 If you are dealing with small spaces, be aware of how you use mirrors and how you organize it. Keep items to a minimum and choose statement pieces that make the space look modern and stylish. All colors bring unique vibrations and set the tone for something particular. 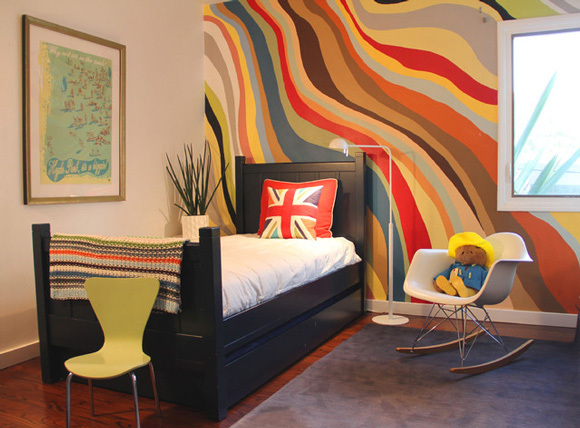 In the case of this orange rainbow, the true message of the room is creativity, artistic expression, and colorful dreams. This wall decoration represents waves of color tones that are warm and cold, they remind us of the view of Earth – yellow, red, blue and waters that connect it all. When we think of nursery rooms, we ought to be gentle and kind. Think of the most loving vibrations – these are the colors that you want to imprint. This little nursery enjoys beautiful decorations of trees, bears, and bubbles. 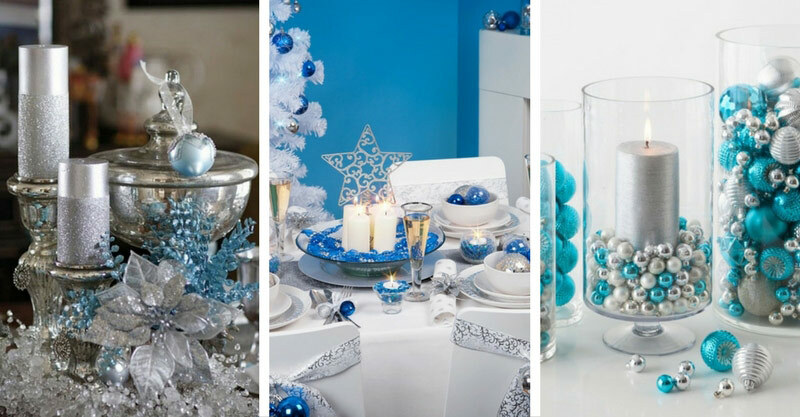 It manifests any baby’s dream – a blue and white environment with softness and colors. Once again, we see colors in a small decoration that acts big by adding style. The sofa has been spruced up beautifully. Gray isn’t the warmest of tones, so the board above the furniture is replenishing the vitality of the room. 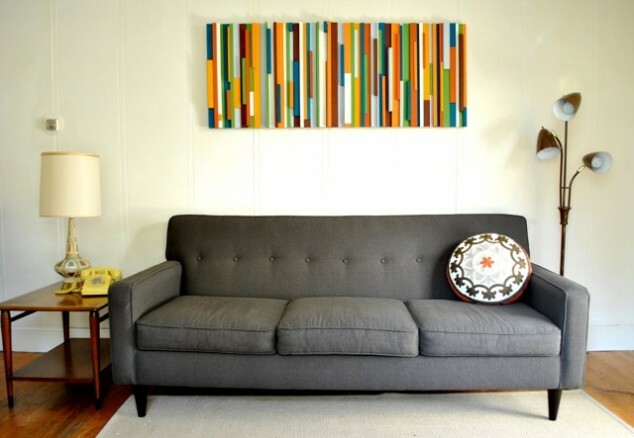 This is great for a living room or any space where you need a touch of color. Geometry is the sacred too of the Universe and Design simply obey the orders. Geometric shapes have been proven to visually attract the eye of the observer. Asymmetrical shapes are eccentric sometimes, but definitely, integrate something unique and add a more personal view. 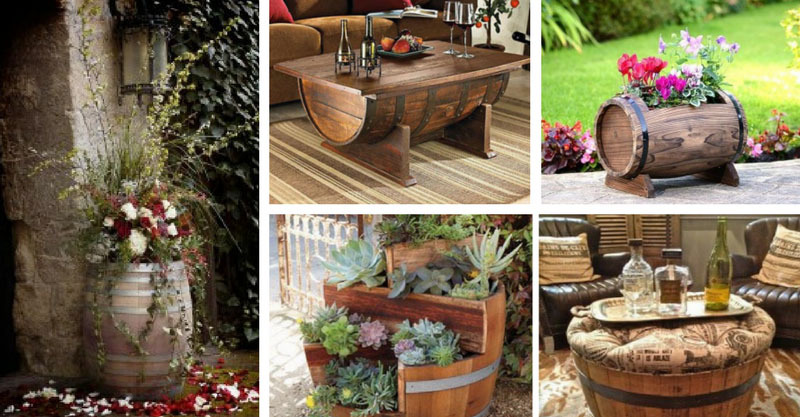 Outdoor spaces can handle this kind of play with décor. People have carved words onto trees for a long time. 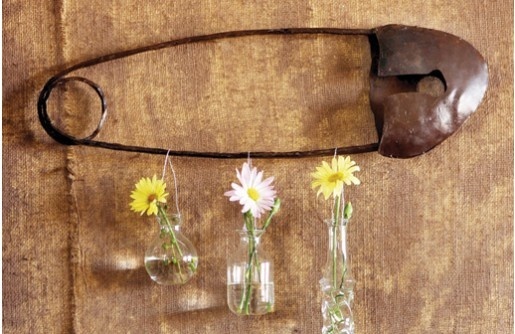 This ancient habit has been transferred into a modern little accessory for the homes. Keeping the child within us living, playing and creating is essential. Therefore this reminder is particularly adorable and works as a little piece of art inside the house. Can you think of ways to create it yourself? I don’t know about you but I can’t really cook or clean unless I have music playing in the background. 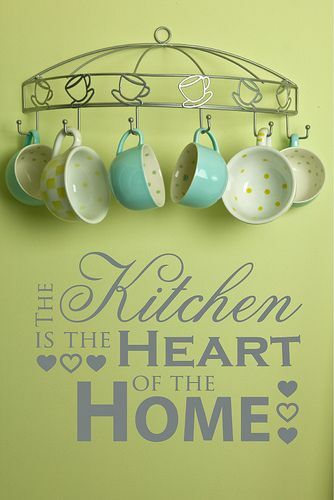 This art sign demonstrates how beautifully we can arrange the mugs, cups and tiny objects around the kitchen. It saves space and decorates at the same time. The sign is just an additional gift for the Soul. 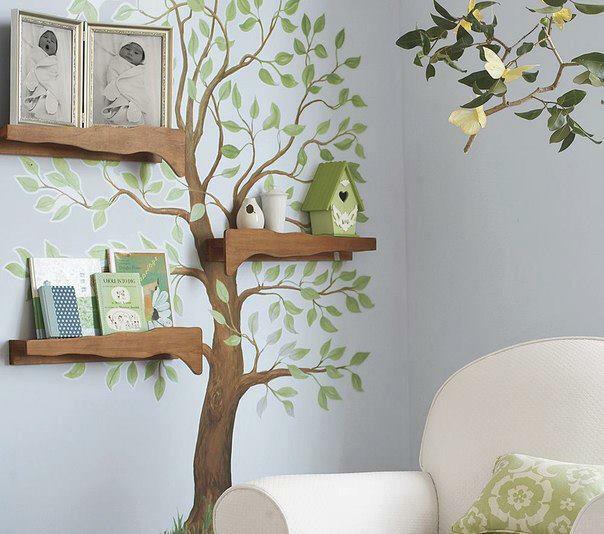 Family trees can be decorated on the wall of a children’s room with relative ease. 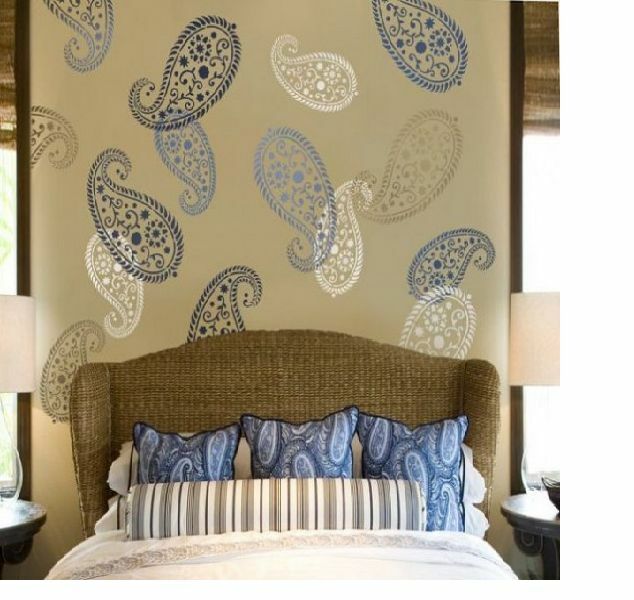 You can find ready patterns that you stick to the wall or first draw them by hand and then add decorative paint. This tree symbolizes the protection, care, and love a child has when it arrives in this world. 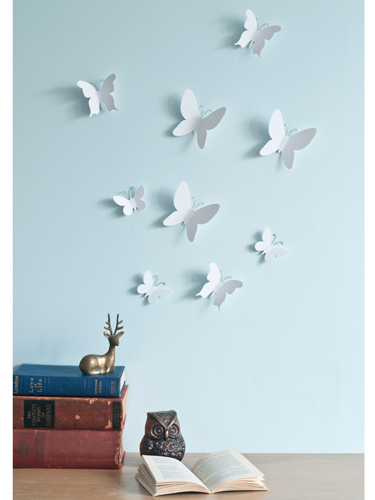 Simple decorations like butterflies, flowers or rainbows are always a jolly good fellow in the house. You can switch themes from time to time and your child will enjoy assisting you in the process. A positive symbol in the room can always uplift the atmosphere and the spirit of the children and the parents. There is a room that is worth staying in! If you are a fan of pink and blue, here is a fun way how to integrate these colors into your living space. 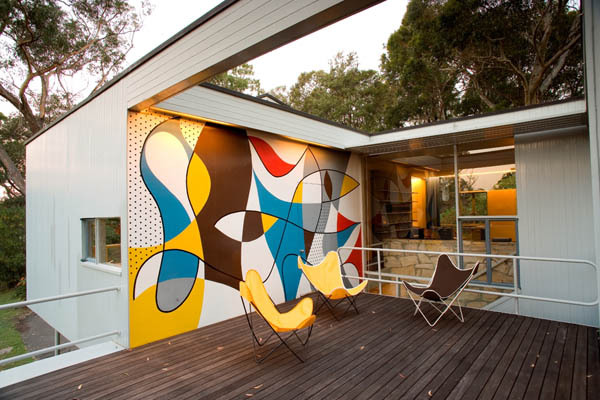 It looks so chick and so stunning, that it’s unlikely you would ever feel grumpy in this space. It’s so sweet! Vintage decors are such a good transformers of the atmosphere. 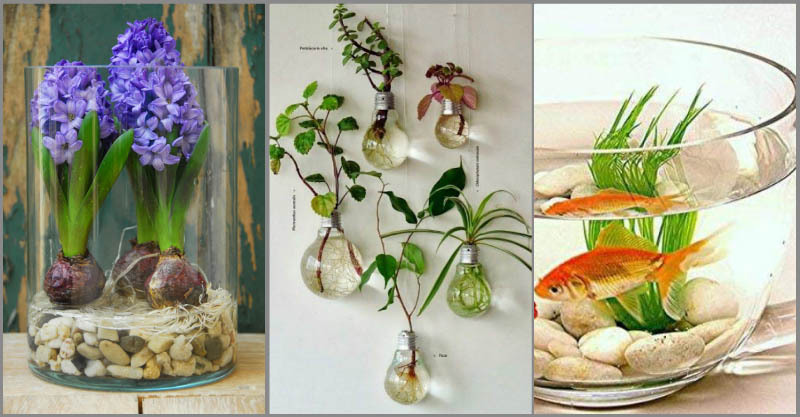 You can add a touch of loveliness in your room, by adding a giant pin or a ladle, a spoon or a good set of pans. The lovely copper cover of the surface always brings joys to my senses. 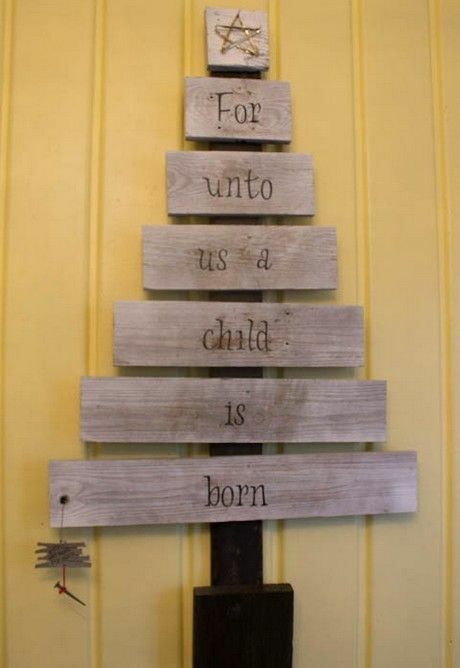 If you can envision your decoration, you are halfway there already. This particular idea is not one to be missed. 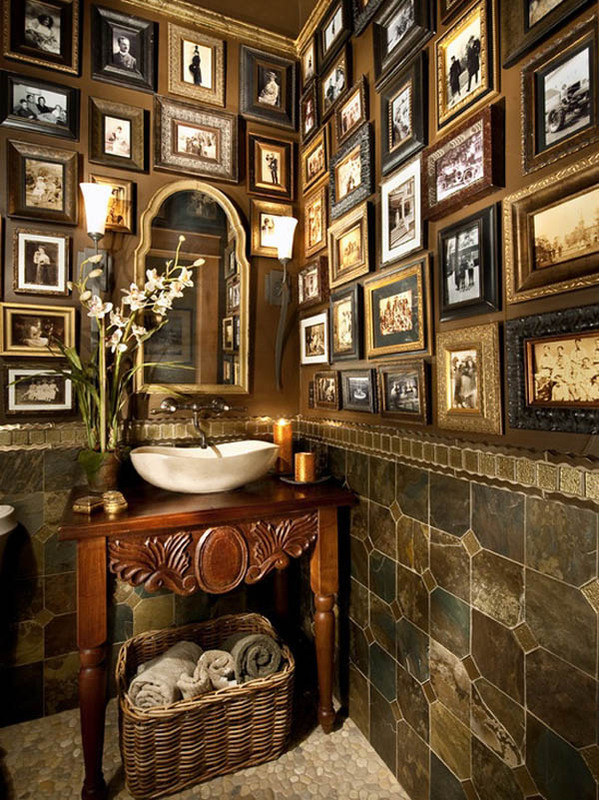 Have you ever thought of decorating a wall or a corner by adding framed photographs that are black and white? There is a retrospective moment for your eyes. Being a parent can be both wonderful and challenging. The atmosphere you surround yourself in is important. This clean, wonderful room brings a smile to your face and makes you really love this cushy, gentle space. It’s artistic and fun, the elements are all set and you have lots of space to enjoy. Corners of the rooms are sometimes the perfect place where you can transfer your dreams into reality. A really good chair where you can relax and feel comfortable is always welcome. Another bright idea is to bring a new element – a green tree and framed pictures that define the character of your corner. We are often guided in life and our doubting, comparing and thinking gets in our own way. By the time we understand this, we have gained what we call useful experiences. 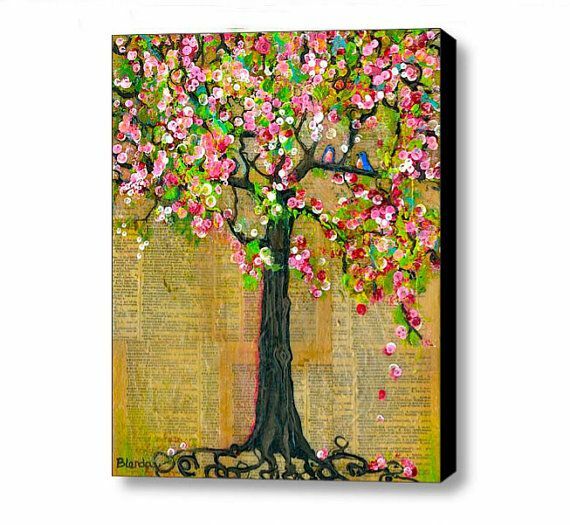 Do you need a colorful reminder that always shows you how a blooming tree is simply enjoying its divine beauty? 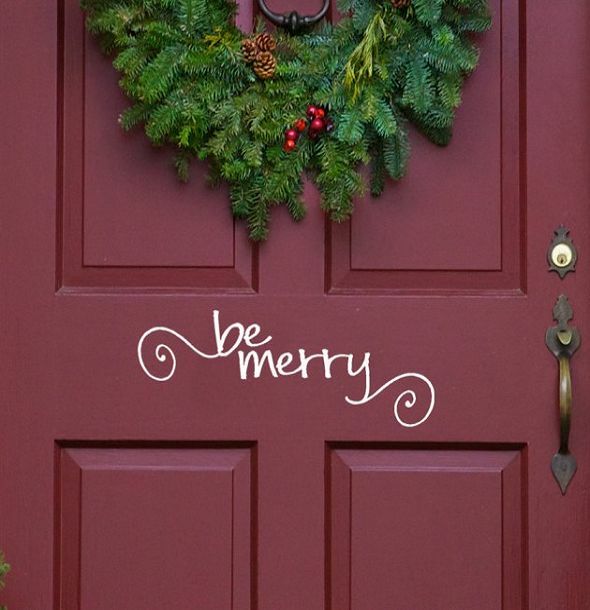 This splendid decoration reminds you it doesn’t always have to be hard. 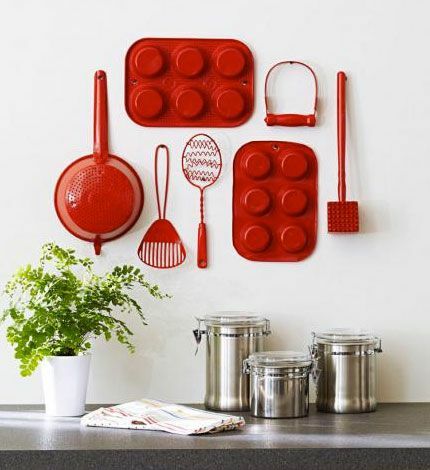 Red means action and the kitchen is the place where we want to be active, efficient and simple. We don’t have to waste hours to cook. Settle in with the right decoration and the subconscious reminder to be energetic and active will always be there when you enter the room. Bright red is the best choice! 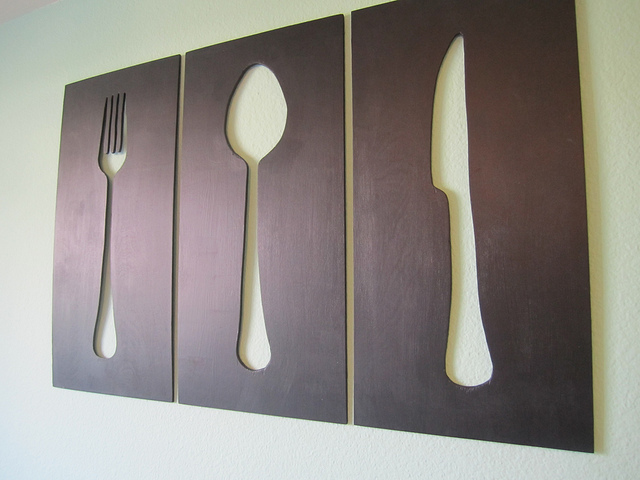 Nothing speaks “kitchen” like these three famous tools that we all use. They spruce up space, play with the interior and are borderline simple. I bet you can find some of these and their variations online or in your local stores. It wouldn’t be hard, give it a try and you will enjoy the details. World maps are a tradition for offices, study rooms, etc. However, they need variety and a new take. 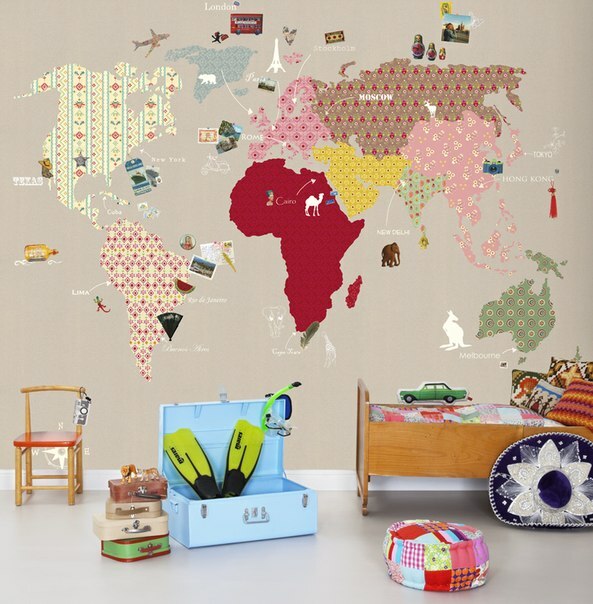 This map demonstrates perfectly how you can enjoy a colorful wall that reminds you the globe is your home and you are free to visit it. Be careful though – it may inspire you to go out there and do some trips!